Welcome to Tiki Trips! We specialize in unique vacations to exotic destinations (warm and cold!) around the world… from HAWAII, MEXICO, JAMAICA, U.S.A., CANADA, CARIBBEAN ISLES & COSTA RICA to the BRITISH ISLES, EUROPE, ASIA, SOUTH PACIFIC ISLES,CRUISES, AFRICAN SAFARIS, SKI GOLF & DIVING TRIPS to special group trips such as FAMILY REUNIONS, BACHELOR/-ETTE PARTIES, CORPORATE INCENTIVE GROUPS, SPECIAL BIRTHDAY & ANNIVERSARY TRIPS & much more, we cover the globe! Most of all, we absolutely LOVE planning the happiest occasion trips, HONEYMOONS & DESTINATION WEDDINGS! Tiki Trips will send you to the best places for your vacation & arrange the best things for to do while you’re there… what more can you ask for? Let the TIKIS work their TRAVEL MAGIC for you! 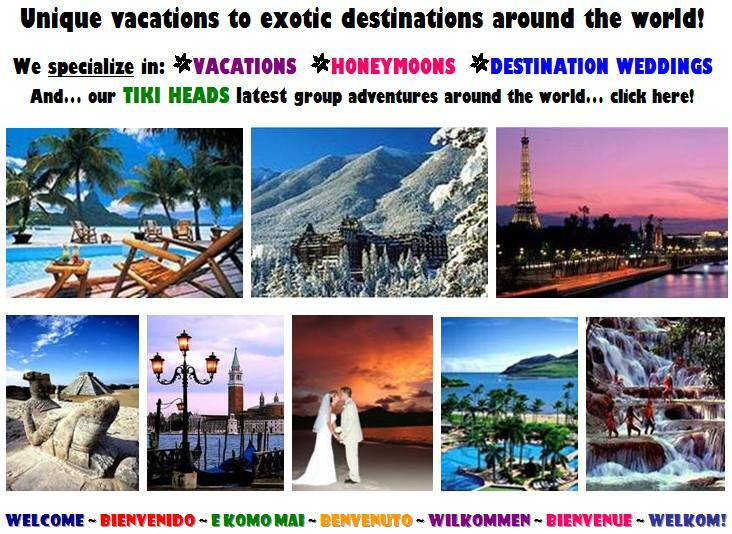 Your TIKI TRIPS agents are trained, EXPERIENCED travel professionals with excellent, expert knowledge of the travel industry & destinations around the globe... your personal TIKI TRIPS agent will have the CONNECTIONS & strong travel industry relationships to ensure your vacation will be the best it can be at a fair price. Most important of all, TIKI TRIPS is your ADVOCATE (just in case!) & gives you peace of mind with our QUALITY ASSURANCE that your vacation will be a smooth, worry-free experience. Plus, you have someone you know that you can call just in case… you can’t say that about the internet! (Do you know the dangers of booking on the internet? See our article at the bottom of this page). 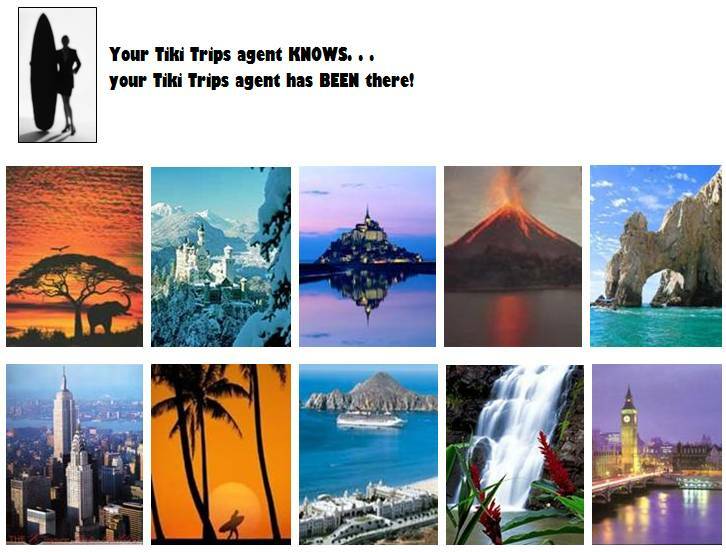 Tiki Trips isn’t your everyday travel agency. We’re a different breed. We sell QUALITY. Nobody wants to buy garbage, therefore we don’t sell it! “Quality” doesn’t have to mean “expensive”… we offer many places in many different price ranges that may not cost a fortune but will still be a great place for your vacation. What we DO offer & recommend to our clients are places we know will be great. We will tell you “whoa!” if we think it won’t be a good trip or good place to stay, & we will guide you to something different if we know something that will be even better. We’ll give you real-world advice just as if we were booking a friend’s vacation. You never have to worry when you book with us at Tiki Trips! 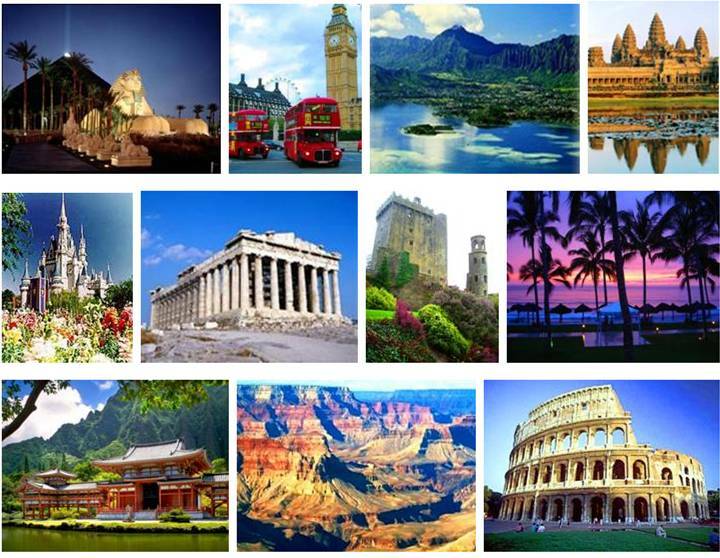 We are a well-respected company in our industry with agents of many years’ experience in the travel business. We love what we do, & folks say it shows. You’ll probably find that we’re a lot more friendly, colorful & fun to do business with because we strive to be different than other regular, “ho-hum” places. Our long-time clients swear by our expertise & trust us in our knowledge, guidance & recommendations. KNOWLEDGE IS POWER… UTILIZE OURS!